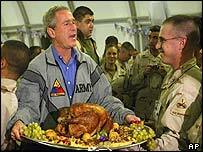 US President George W Bush has made a surprise visit to Baghdad to mark America's Thanksgiving holiday. The event was kept secret until Mr Bush left the Iraqi capital because of security concerns. Had word of the trip leaked it would have been cancelled. 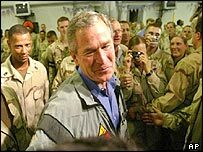 Mr Bush spent two hours having dinner with about 600 stunned US troops at Baghdad airport before leaving Iraq. Even they had not been told in advance that Mr Bush was coming on the visit, the first to Iraq by a US president. Mr Bush declared major combat in Iraq over on 1 May, but since then 70 more US soldiers have been killed in hostile action than during the war itself - and November has been the worst month for casualties so far. The BBC's Orla Guerin in Baghdad says the visit will have given battle-weary troops a much-needed morale boost. Paul Bremer, the top US civilian administrator in Iraq, who was on a scheduled visit to the troops, told them he was going to read a message from the president. But he then announced he would defer to the most senior person present - Mr Bush's cue to appear. "I was just looking for a warm meal somewhere," Mr Bush said. "Thanks for inviting me to dinner ... I can't think of a finer group of folks to have Thanksgiving dinner with than you all." Mr Bush told cheering troops he brought a message on behalf of America: "We thank you for your service, we are proud of you and America stands solidly behind you." He said the US would not give up in the face of ongoing guerrilla attacks. "We did not charge hundreds of miles into the heart of Iraq, pay a bitter cost of casualties, defeat a ruthless dictator and liberate 25 million people only to retreat before a band of thugs and assassins," he said. The remark brought one of several standing ovations he received from soldiers of the 1st Armoured Division and the 82nd Airborne Division. Mr Bush left Texas on Wednesday night, stopping briefly in Washington to change planes before heading to Iraq. The trip was shrouded in secrecy. Secret service agents guarding his Texas ranch were not told, and his family found out only a few hours before he left. It had earlier been announced that Mr Bush would spend Thanksgiving with his family at his Texas ranch - a menu for the dinner was even made public, the Associated Press reported. 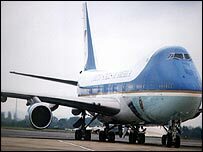 Air Force One arrived at Baghdad International Airport at around 1732 local time (1432 GMT) on Thursday - landing in darkness, with its lights dimmed to make it less of a target. A missile had been fired at a courier plane landing in Baghdad at the weekend. The plane landed safely despite being hit and having a wing catch fire. Mr Bush spent around two-and-a-half hours with US troops before heading back to Washington. He was with a small pool of journalists and camera crews - who were not allowed to report on the event until after they were airborne again. The BBC's David Bamford in Washington says the trip stirred a ripple of patriotic enthusiasm at home as Americans learned the details of the secretive visit. Mr Bush's trip comes on the heels of a brief visit by UK Foreign Secretary Jack Straw, who also did not announce his trip. The US Deputy Defence Secretary, Paul Wolfowitz visited Baghdad a month ago. A rocket was fired at the hotel where he was staying, killing one US officer. President Bush's father visited US troops in Saudi Arabia on Thanksgiving Day 1990, on the eve of the first US-led war in the Gulf. "He needs to reassure the troops and the American public that project Iraq is going well"